Do you like Chaotic Garden? Share it with your friends. 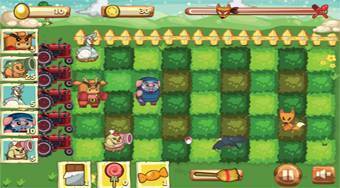 Chaotic Garden is a great strategy that resembles the legendary Plants vs Zombie game and has a total of twenty different levels of difficulty ready for you. In each round, place the available animals on your farm field to destroy all the waves of enemy animals attacking your farm. Be sure to always place geese holding golden egg on the farm, for which you can then buy other animals in the form of animals.